If you are doing a job you must be aware of Gratuity. Gratuity is an amount payable to the employee at the time of leaving a job. It is a big amount. It is the right of the employee and no employer can deny it. I have recently received a query about the gratuity. The question was – Recently I have resigned from the job. I have completed four years and seven months at the time of resignation. Am I eligible for the gratuity amount? What amount will I get as a Gratuity? Well, Answer is simple as you have completed 4 years and 7 months which is near to 5 years (eligible age) you are eligible for the gratuity amount. This is just an example. There are many such questions about gratuity that may be popping up in your mind. 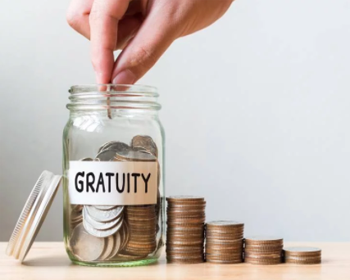 If it is a case here is 10 important points to know about the gratuity. As per definition gratuity is a sum of money paid to an employee at the end of a period of employment. It is also known as a reward for the good services rendered to the organization. – Gratuity is payable only after completion of 5 years from Date of Joining/Absorption, after separation from the company. – There should not be any break in your services. Entire job tenure should be in the same organization. The service period is rounded off to nearest integer this means if you have done a job for 4 years and 6 months you are eligible to get gratuity amount. Above 6 months is considered as a completed year. – Above rule of 5 years is not applicable in case of disablement or death. The entire amount is given to legal heirs or nominee. Gratuity amount is calculated as on Date. The employer has to pay the amount as per formula. – From above formula, one can clearly say that amount of gratuity depends on last drawn basic monthly salary and qualifying years of the service. – The rule of gratuity is applicable to the organization with more than 10 employees. If total employees are less than 10 this rule is not applicable. – The amount paid as a gratuity is tax-free for the government employees. For private sector employees total 20 Lakh is tax-free. An additional amount is taxable in nature. This total amount is lifetime amount. – The formula given for the calculation is for the reference. An employer can give amount exceeding this formula. However, an additional amount will be taxable. – An employer can penalize employee by not paying gratuity amount, in case employee makes a loss to the company. However, employer has to terminate service of employee due to this damage. – If the service of the employee is terminated for his riotous or disorderly conduct or any other act of violence on his part gratuity may be wholly or partially forfeited. I have tried to cover major aspects of gratuity act. In case you have any specific query or confusion you are requested to post it in the comment section. I have surely try to answer your query. I have 8 months of contract experience and post that I was promoted as permanent employee (4.7 months) in my previous company. Will the contract experience be aggregated? So we’ll be eligible for gratuity? If termination letter is not given during your job tenure and you have served continuously, your contract period will be considered for gratuity. Last Drawn salary amount will be used for final calculation.Either calculated amount or 10 lac whichever is higher that will be paid.